It’s a challenge for me to walk past a spiced nut stand in the mall or at a festival. I love the aroma of nuts roasting amongst gooey sugar and spices. This time of year, the smell of roasted nuts and a steaming mug of Glühwein transports me to the magical German Christmas markets. Another challenge for me is roasting nuts at home over a burner on the stove. It requires patience and a watchful eye to make sure the sugar doesn’t scorch. I can do it, but have found a method I find much easier. Hello, Crockpot! While the total time it takes to make these in the crockpot is two hours, it is not an active two hours. And I have a much higher success rate than using the stovetop method. Plus it’s like having a wonderful scented candle burning except you get a tasty snack, too! 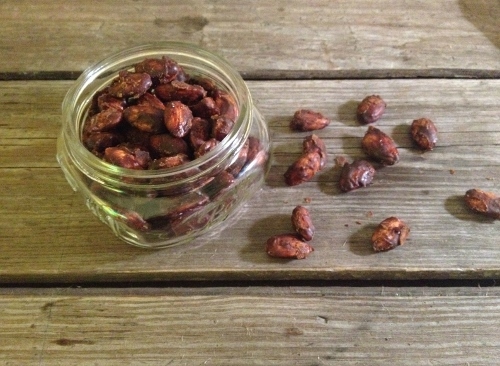 And here’s the super cool part about this recipe: it works for pumpkin seeds (pepitas) as well as for nuts! 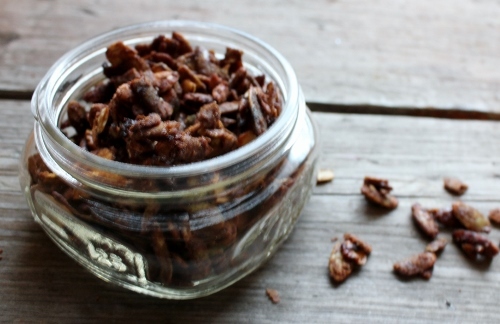 If you need a sweet gift for a friend who doesn’t eat or enjoy nuts, try it with seeds instead. I may actually enjoy the seeds more than the nuts. I’ve been sprinkling a handful atop salads. These have been one of my favorite giftables this holiday season. I put them in wide mouth half pint jars (I use these, from the Elite collection of Ball jars) and then put a cute label on the jar lid. Below the recipe, you’ll find a free printable for labels. The labels are a 2 1/2″ circle. 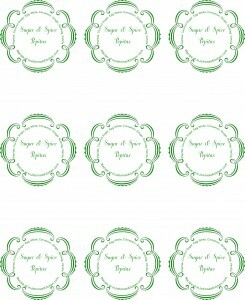 I print mine on these kraft paper labels. You can print them on plain paper and use a glue stick to affix them to the jar lid if you don’t want to buy labels. 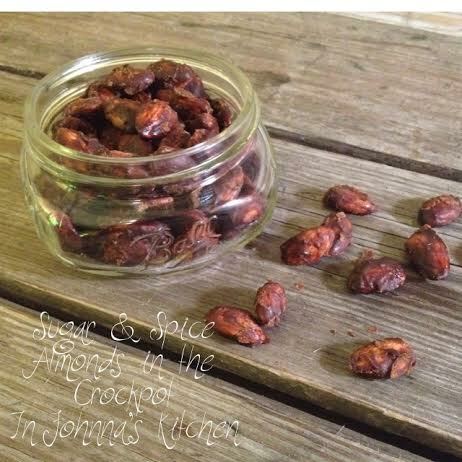 Just click below the recipe for the printables, one for almonds and one for pepitas. In a large mixing bowl, stir together egg white and vanilla extract. Add almonds or pepitas and stir well to coat. In a smaller bowl, combine coconut sugar and spices. Stir well to combine. Add sugar and spice mix to nuts or seeds, stirring well to combine. In a 4 1/2 quart crockpot, spray non-stick cooking spray or lightly coat with oil of your choice. Pour nut or seed mixture into crockpot. Turn on to high. Stir every 30 minutes. Cook for two hours. After two hours, turn out ingredients onto parchment paper on countertop. Allow to cool. 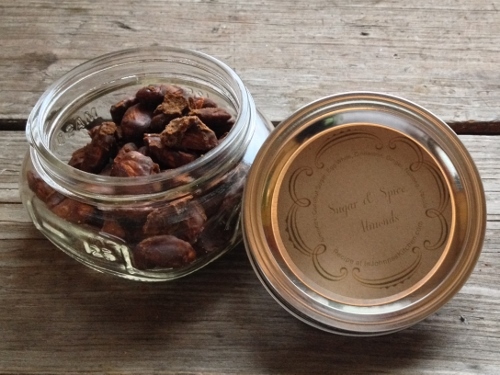 Break nuts or seeds up a bit before placing into jars or airtight container for storage. Enjoy!